This week I will focus on how to find a free domain that allows you to position your website easily. Many electronic stores and companies invest an excessive amount of money in a domain they are going planning to use for their projects. A clear example was AOL’s purchase of the domain games.com for nearly 11 million in 2006. 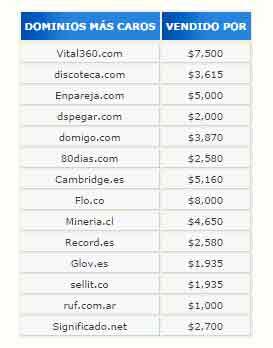 Domains with key words such as shoes.com or sunday.com were sold last August for $3615 and $3870 respectively. 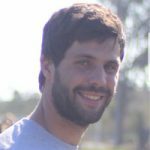 As you now, having a domain like either of those mentioned above, with the keyword discoteca or Sunday, allows you to more easily position your website in search engines and get more traffic. However, there are some tricks to finding free domains in different niches of the market at affordable prices for everyone’s pocket. We began the search by using the Sistrix tool and scanning Wikipedia for a list of keywords. We use Wikipedia, because any search that you make on Google will link to Wikipedia. Therefore, it allows us to obtain a reliable list of keywords with the highest search-rate. Once scanned, we arrange them from high to low search rates and export them to cvs, which allows us to create a list of thousands of the most searched keywords. 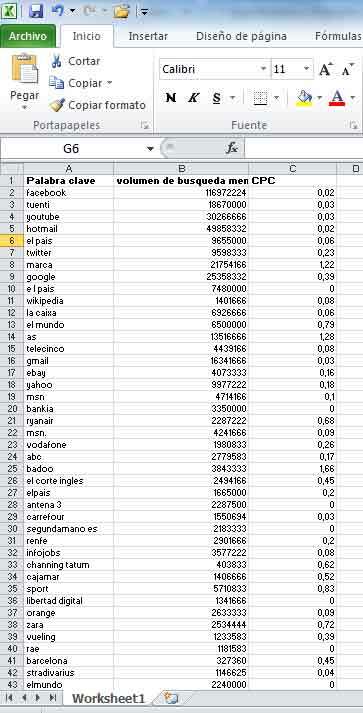 Within this list we not only observe the search rate, but the CPC of each as well, in other words, which word each click pays in Adwords. The trick would be to know if this keyword list can find a free domain that allows us to position our website in an easier way, since we would have the built-in keyword domain. 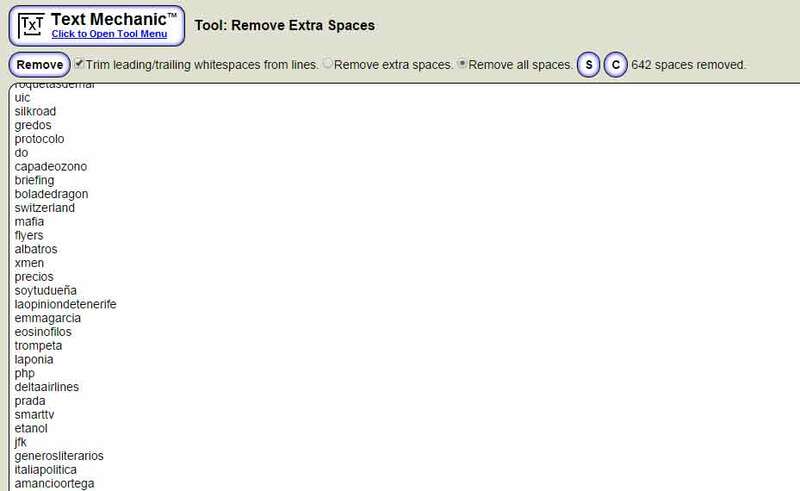 To do this, we will select a certain number of words from our Excel file and copy and past them into the Text Mechanic tool, allowing us to eliminate those spaces of selected words upon clicking ‘remove all spaces’. Once we have all of the words without spaces, we copy and past them in DomainTool – Bull Checker. 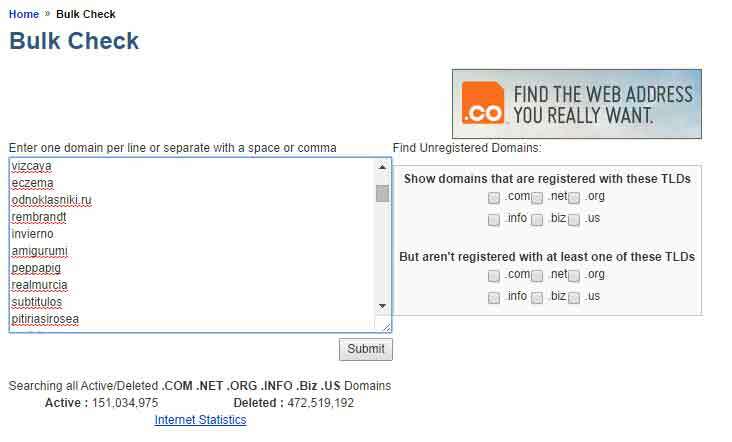 Clicking ‘submit’ we obtain within seconds a list of domains formatted .com .net .org .info .biz or .us as you observe in the image below. 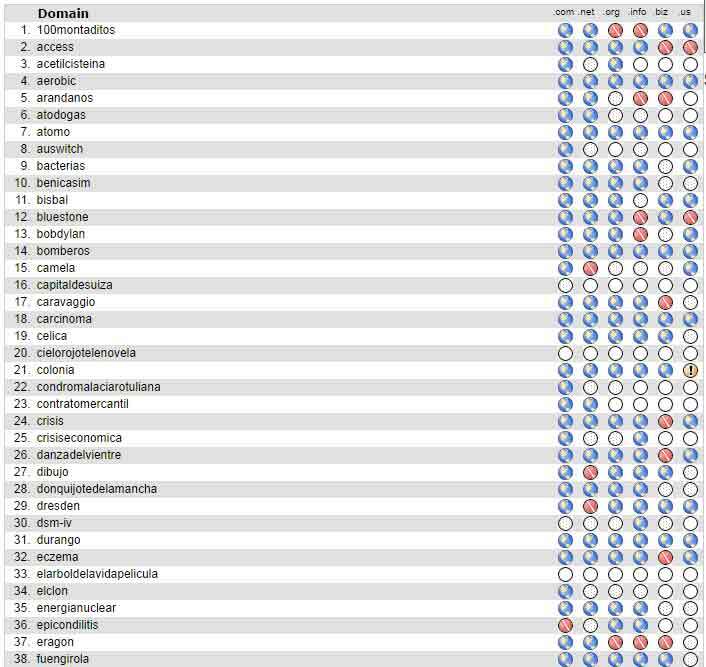 The white circles show the free domains that remain, seeing in an instant thousands of free domains that may interest you. This tool, aside from permitting you to see which domains are available, also lets you record the domains that you like by clicking the circles. With this simple method you get to see which domains are free and register the domain with that exact keyword, positioning it in a quick manner within your niche of the market. In this way, you can analyze hundreds or thousands of domains in just a couple of minutes, saving valuable time.